Posted in Articles on March 16th, 2011. By the late 1960s, Gene Vincent was still performing, but playing small clubs with pick-up bands and scraping a living. In May 1969, in an attempt to renew record company interest in him, Gene recorded 3 new songs plus a version of Chuck Berry’s Roll Over Beethoven in a home studio, and these recordings were touted around various companies including A&M, Dot and Liberty, without any success. The songs were never recorded again in any of his subsequent sessions. Gene had retained contact with his English fan and friend Adrian Owlett over the years. “Gene was in the habit of telephoning in the middle of the night UK time being fairly unconcerned with the time difference. One morning at about 3 he called to play me a tape of Rainy Day Sunshine which he had just that day recorded. It was unmixed and the quality was not too great but the voice was still there. He told me that he was getting this track and three others cut to acetate and that he would mail them to me”. (1) The disc arrived shortly afterwards and Adrian, after making a tape safety copy, “arranged to see many industry A & R people but it was a time when you couldn’t get arrested for singing rock ‘n’ roll.” (1) One Sunday a little later, Adrian, listening to John Peel’s show, heard “the curiously named ‘Family’ and their set was, surprisingly, comprised mainly of regular rock ‘n’ roll standards…I decided to contact him and to my surprise received a response asking me to give him a call concerning the Gene Vincent tracks that I had told him I had.” (1) Adrian made contact and met up with John, playing him a tape of the new recordings, and giving John Gene’s address and telephone number. In July that year, John Peel had got together with the UK head of Elektra Records Clive Selwood (who, with his wife Shurley, also managed John) to form Dandelion Records, allegedly named after a hamster that Marc Bolan had given John. To be distributed in the UK by CBS, the idea of the label was to issue releases by performers that John liked but who had no record deal. These records sold in small quantities and the label folded in 1972. They are now quite treasured as memorabilia of a rather whimsical period of UK rock music. John told Adrian that he would love to have Gene on his fledgling label. In the first week of August, Clive and Shurley Selwood travelled to Los Angeles to finalise the deal with Gene. Gene Vincent was born in Norfolk, Virginia in 1935. Despite a serious motorcycle accident in 1955 whilst he was on leave from the US Navy, when his left leg was permanently damaged, he went on to make a successful career in the music industry. In 1956, his first single Be-Bop-A-Lula on the Hollywood based Capitol label was a smash hit internationally within weeks of its release and earned him a gold record for 2 million sales within a year. His subsequent two singles made the charts, and in 1957 he had another huge seller, Lotta Lovin’, for which he received a gold record for sales of 1.5 million. This CD contains re-workings of these two songs. Touring widely with his acclaimed backing group The Blue Caps, Gene was renowned for his wild stage act, and made appearances on TV and in several films, including the excellent The Girl Can’t Help It, which also featured a number of other great rock ‘n’ roll performers, including his soon to be buddy, the short-lived Eddie Cochran. His final USA chart single, Dance To The Bop, spent 9 weeks in the Billboard chart. When his career in his home country faded in the late 1950s, a visit to England for TV performances and live performances re-ignited his star, and, until the emergence of The Beatles, Gene Vincent was the biggest live draw on the touring circuit in the UK. He had 5 singles in the UK charts during the years 1960 and 1961. By 1965, with 8 albums under his belt, however, his popularity had waned and, after living in the UK for 3 years, Gene returned to obscurity in the USA. In 1966, Challenge Records recorded several sessions with Gene which produced three poorly selling singles. In the UK and France the next year, these recordings were collected together onto a very good eponymous album on the London label and attracted enough interest for Gene to make an enthusiastically received tour of France. 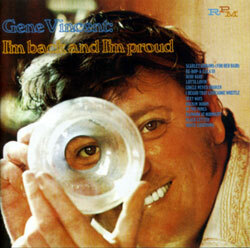 In the UK, Capitol Records released Best Of Gene Vincent LP, the first of very many reissue records. John Peel, the popular pirate radio DJ, now presenting the programme Top Gear on the newly opened BBC Radio 1 station, played a track on air and expressed his admiration for Gene’s records. The colourful Kim Fowley “had been a fixture around the Los Angeles music scene since the time of Phil Spector. At some six feet four inches tall and with crazy eyes…(he) always had a hustle going.” (2) He and Gary Paxton had recorded the 1960 hit Alley Oop by the non-existent Hollywood Argyles, and Fowley was involved with other successful novelty singles: The Trashmen’s Surfing Bird, Paul Revere and The Raiders’ Like, Long Hair, B Bumble and The Stingers’ Nut Rocker, The Rivington’s Papa-Oom-Mow-Mow, and Popsicles And Icicles by The Murmaids. During the mid 1960s, he spent some time in London as P J Proby’s publicist, and writing and producing singles by then obscure musicians such as Cat Stevens and Ritchie Blackmore. He also recorded himself, producing a record about the psychedelic experience The Trip in 1965, and They’re Coming To Take Me Away Ha-Ha in 1966. Exactly how Kim Fowley came to act as producer for the proposed Dandelion album is rather obscure. Susan VanHecke suggests that he was an acquaintance of “Bones” Howe, now well known for his production work with The Mamas And Papas, Fifth Dimension and The Association, who was then producing Gene’s younger sister under the name Piper Grant. “She’d put a plug in for her currently hit-less brother, and Howe had passed the word to Fowley.” (3) Clive and Shurley Selwood had a meeting with Gene and Kim at the Hotel Roosevelt. “It was a most bizarre evening. Gene introduced Kim…Kim advanced across the room and said ‘Hey, grease me some of that teenage dogshit!’ Gene talked about the album cover and said ‘Why don’t we have a picture of me standing around my star’” (in the Hollywood Hall Of Fame in the sidewalk opposite the Capitol Tower). (4) Clive thought that was a good idea but that “Gene was a bit odd and Kim Fowley was considerably odder” (4). However, they agreed a deal on the album. Some pre-recording rehearsals, took place at “Skip” Battin’s house in Laurel Canyon. Battin had been brought in as musical director and bassist. He, like Fowley, had collaborated with Gene Paxton, recording several reasonably successful singles, It Was I, Fancy Nancy, and a cover of Marvin and Johnny’s R & B hit Cherry Pie, under the name Skip and Flip. He is better known today for his work with The Byrds from 1970 to 1973, and later The New Riders Of The Purple Sage and The Flying Burrito Brothers. “I worked with Gene very closely and we pretty well let him do what he wanted. We got together maybe half a dozen times over a period of about two weeks.” (5) Gene and Kim were interviewed for The Globe newspaper around this time, saying “We won’t be doing any intellectual rubbish on this album. Today’s public demands simple – real music”. (4) Fowley had lined up an impressive group of musicians to record with Gene. Gene had wanted his old acquaintance Al Casey, the veteran recording session guitar player who had backed him on some of his Challenge recordings, but his schedule wouldn’t allow it. A little known Jim Fonseca was set for the rôle of lead guitarist, Mars Bonfire a Canadian best known for writing Born To Be Wild for Steppenwolf, which featured in the soundtrack of the film Easy Rider, would cover rhythm guitar duties, Grant Johnson keyboards, and on drums, Jim Gordon, who had backed The Everly Brothers, played on The Beach Boys’ Pet Sounds album and was a very sought after session player. Later, changes and additions would be made. Clive Selwood had used his company contacts to book the Elektra Sound Studios on North La Cienega Boulevard, Los Angeles. It wasn’t what Kim Fowley had wished. “I wanted to record in the South at Malaco studios. I felt it would be the ideal environment for Gene Vincent.” (4) But Elektra executive David Anderle was having none of that. He also insisted that Fowley use the recording engineer Allan Emig, “an older man into jazz and folk, nothing to do with this type of music.” (4) The first session took place on 21 August, when the tracks Be-Bop-A-Lula and Rockin’ Robin, a novelty song that was Bobby Day’s only hit in 1958, were recorded. The session was not a happy one and the recordings were either scrapped or recorded over. Gene telephoned Adrian, telling him he “was struggling with a ‘new’ approach to recording whereby tracks were assembled almost without his attendance being required…Gene told me that he was working with a ‘maniac’ and he was eyeball to eyeball about the guitar sounds that were coming out.” (1) He also telephoned Clive Selwood. “We had a series of mad phone calls from Gene. He’d…keep going on about Kim, he said, ‘I can’t work with him.’ Shurley mainly took the calls.”(4) But perversely, Gene didn’t want Fowley replaced either, so the sessions went ahead anyway. Gene was very unhappy with Fonseca’s work on lead guitar and he was removed. After some discussion, Red Rhodes, the pedal steel guitarist who had played on sessions by The Ventures, The Byrds and ex-Monkee Michael Nesbith, and was due to play on some country style songs on the sessions, revealed that he performed locally with legendary ex-Blue Cap lead guitarist Johnny Meeks. Johnny was duly contacted and came on board. When the album was complete, Gene called Adrian Owlett and asked him to write the album notes. The “next call I had from Peel was an invitation to hear the newly received master tape and I duly went up and spent another pleasant evening heightened of course with some brand new Gene Vincent recordings.” (1) Adrian was very touched by the recorded dedication to him and John that Gene had inserted into the introduction to (I Heard That) Lonesome Whistle. John Peel also asked Adrian to write the notes for the release. Adrian was pleased to do this, but “had some difficulty actually getting the correct names of the personnel involved! John Lennon had offered to make a note and a drawing for inclusion but for some reason this never happened.” (1) John Lennon and Gene had recently been reunited on 13 September when they both performed at a Rock ‘N’ Roll Revival Show in Toronto. In late 1969, the album, entitled I’m Back And I’m Proud was issued by Dandelion in the USA, and in the UK, a single coupling Be-Bop-A-Lula ’69 with Ruby Baby was released ahead of the album, but to no chart success. The next year, the album was issued in the UK, and a second single coupling White Lightning (a song he and Eddie Cochran had sung together on the famous Jack Good UK TV show Boy Meets Girls in February 1960, just two months prior to the latter’s death in a road accident) and Scarlet Ribbons was released. A review of the single in the weekly music paper NME on 9 May informed its readers that “it is a rocker impregnated with a strong country feel. The mid-tempo beat is compelling and the novelty lyric praising bootleg liquor is amusing.” It also failed to sell significantly. The album, however, did cause interest amongst European Gene Vincent fans, and on the back of it he came over to tour, playing ten dates in France in October, and the next month, nine dates in England including a sell out performance at the London Palladium, where he was introduced by Radio 1 DJ Emperor Roscoe, plus one date each in Northern and Southern Ireland. Gene Vincent went on in 1970 to record two further albums on the Kama Sutra label, some tracks being issued on singles, but with no commercial success. He toured France again in June that year. His life went into serious decline and, following a disastrous tour of the UK in the autumn of 1971, he returned to California and died from an upper gastrointestinal haemorrhage shortly afterwards. He was 36 years old. Over the decades since, he has been a much reissued performer, and is now considered a major rock icon. In 1986, the I’m Back And I’m Proud album became the very first Gene Vincent CD release on Adrian Owlett’s Nightflite record label. All Gene Vincent’s many studio recordings are currently available on CD. (2)	Mick Farren “There’s One In Every Town”, The Do Not Press Limited, 2004. (3)	Susan VanHecke “Race With The Devil”, St. Martins Press, 2000. (4)	Steven Mandich “Sweet Gene Vincent The Bitter End”, Orange Syringe Publications, 2002. (5)	Britt Hagarty “The Day The World Turned Blue”, Blandford Press, 1984.